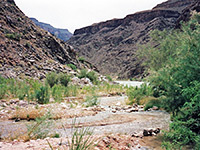 Diamond Creek is a small tributary of the Grand Canyon that flows year-round, joining the Colorado river 16 miles north of the dusty Hualapai Indian tribal town of Peach Springs, which is situated at the head of the southern end of Peach Springs Canyon. This is one of the larger of the many hundreds of branches of the main canyon - it deepens gradually but steadily from an elevation of 4,950 feet at the town to 1,550 feet at the river. Vehicular access is possible along a bumpy, unpaved track (Indian Reservation Route 6) which thus provides the only such route to the Colorado between Pearce Ferry and Lees Ferry, 200 miles apart. The track ends at a beach, with sand dunes and pleasant grassy areas where Diamond Creek meets the Colorado, and is quite a wonderful place. There are various sites for camping, in such a remote location that other visitors are unlikely. 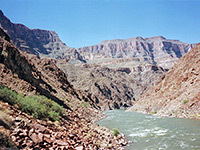 This part of the Grand Canyon is known as the Lower Granite Gorge, and has weathered, colorful, igneous cliffs that rise steeply from the river; these are the oldest rocks in the canyon - underneath all the many different sedimentary layers, they date from the pre-Cambrian era, over 700 million years ago. All travel off the main road into the Hualapai Reservation requires a permit; the cost is currently (2019) around $30 per person. They may be purchased from the Hualapai Lodge, in the center of Peach Springs on US 66. 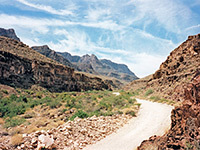 The track down to the Colorado starts from the end of a residential street at the northeast edge of town; for the first few miles, the road passes along a dry, dusty stream bed in a small canyon, past clumps of trees and bushes, and then crosses more open land with scattered cacti - close to the springs after which canyon and town are named. The canyon proper starts 6 miles from town - the road through it is quite straight and the surface is fine for normal cars although a bit uneven in places. As the canyon deepens, the types of cacti and other plants change noticeably, especially in early summer when they are in flower. There are distinct bands of large white lilies, clusters of purple echinocacti, various colors of opuntia, and finally ocotillo and large ferocacti at the lowest elevations near the river. The surrounding cliffs become steadily higher and more impressive, and several side canyons join from both sides, including the ominous-sounding Hells Canyon. The last branch is Diamond Creek Canyon, which has water flowing through all year round. The road then crosses the creek about 6 times, and for a short distance runs along the streambed. The water was at most 4 inches deep in late June, but may of course be much deeper at other times. There is a car park and camping area just before the first stream crossing. 1.5 miles after the creek is first encountered, the road emerges onto a wide, sandy beach beside the Colorado river, a total journey time of almost 2 hours. Each morning, the Hualapai Indians drive down from Peach Springs with rafts and passengers, for accompanied trips down river - the boats emerge at Pearce Ferry in late afternoon (places are not cheap though, costing around $200 per person). A few other people make the journey for day trips, but this remote corner of the Grand Canyon is generally peaceful and little-visited. 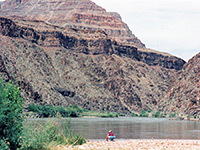 The temperature is always at least 20° hotter at the river compared with the land around the main road (US 66) due to the 3,400 foot elevation difference; it often exceeds 100° for 4 months of the year. There is also a big contrast in water temperatures - the fast-moving Colorado is always cold - 60° in June whereas the much gentler flow of Diamond Creek is a pleasant 80°.